Home Moto "Shaking hands with Rossi was like the first kiss to a girl"
"Shaking hands with Rossi was like the first kiss to a girl"
"It was a moment of the race, my congratulations because he made a very fast weekend and a very fast race, it was normal", says the Italian. One of the images that will be remembered most of the GP of Argentina was the handshake between Rossi and Márquez in the anteroom of the Termas de Río Hondo podium. 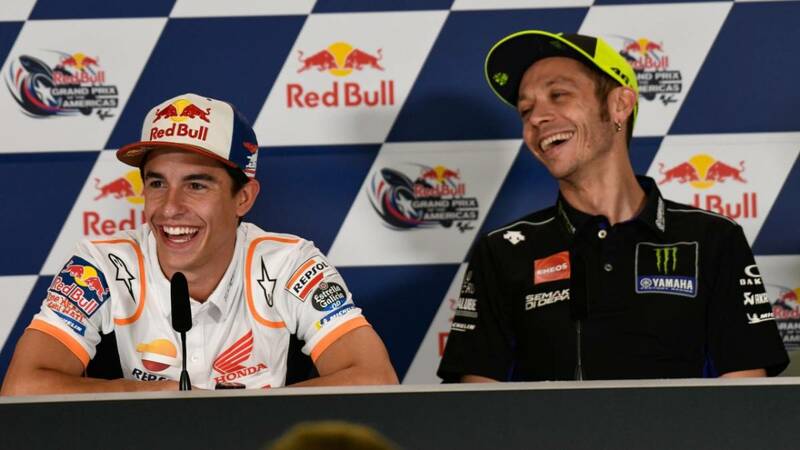 It should be something normal, but it was not like that between them precisely since Marc pulled Valentino last year in the Argentine track, he went away afterwards to apologize to the box and to throw him, without receiving him, his friend Uccio. In addition, there were some statements from the Italian in which he claimed, among other things, that he was afraid of running with the Spaniard. For that reason, had a special value that handshake after the resounding victory of Honda and the great second of Yamaha. Now they have returned to coincide in the press room with which the GP of the Americas started and both greeted each other and they normalized that handshake. As he asked both of them for it. The first to respond was Márquez, who made a nice comparison: "It was a moment, in Argentina we gave each other our hands and was like the first kiss with a girl, that yes, if not, and you are without friends so that We were both happy there after a great race and it happened From the first day I said that I had no problem in maintaining a respectful and professional relationship and it was fine, but now (smiles) it's again like with a girl and you ask yourself: is there second or there is no second? " There will be more: "I think the ice has already been broken and that's important, I do not think there's any problem, today, for example, we have greeted each other." Ciao Vale "." Ciao Marc ". I already said it, Being friends is difficult, but a relationship of professionalism and respect is no problem. " Rossi was shorter, but also sincere: " It was a moment of the race, my congratulations because it made a weekend very fast and a race very fast, it was normal. " Already in the 'canutazo' with the Spanish journalists, Marquez was asked ironically if Rossi and was not afraid to run against him. The Repsol Honda rushed laughing: "I will not go in. In Argentina I did not scare anyone" .